If you asked Gideon Padi Konotey some years ago what he wanted to do with his life, he would have heard him say he was aspiring to be a graphic designer. But that was set to change after he lost his grandparents. They would leave an inheritance which would change his career path – a herd of goats. The goats were virtually forced on him since no member of his family had a real use for them. Mr Konotey was given the task of continuing his grandparents business of rearing goats. Then an idea hit him. “I thought to myself, why not move from just the rearing to adding value to them,” Gideon told JOYBUSINESS’ Daryl Kwawu as they walked into his goat pen at Kotobabi in Accra. Adding value meant, processing the goats into various consumables. That was the birth Goat Masters. It was not an easy challenge for Mr Konotey at the beginning as he was sometimes mocked by people who thought it unthinkable what a graphic design would be doing with goats. “You’d hear people comment that I smelled when they saw me carry droppings to the refuse dump. But I was not deterred”, Mr Konotey recounted. He was determined to change the face of his business once he started, so he got investors involved. But that would result in one of the biggest challenges he would face. Goats he had ordered from Burkina Faso would contract a disease. He nearly lost all of them and was saddled with debt. What kept Gideon going was his determination to succeed. “The key to surviving is God first, hard work next and then focus. My uncle left me a plaque which says, determination today leads to success. I hold that dear”, he shared. 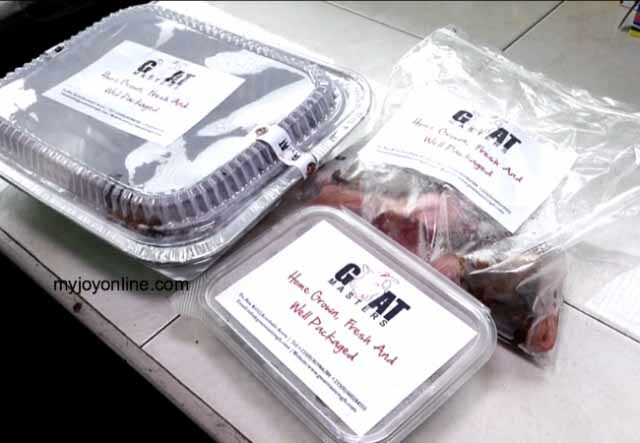 Goat Masters is gaining grounds with six workers making deliveries across the city of Accra and his vision is big. He aims to establish the biggest livestock market in Africa. Gideon knows it’s a big task and whenever he fails like he would not attain his goal, he remembers his uncle’s plaque. Next articleAfrica Won 43 Medals at the 2016 Olympics, But Where Do We Go From Here?